Our world involves a lot of wedding gowns. Sometimes we’re making last-minute alterations so that a bride feels like her gown fits her like a glove as she walks down the aisle. Other times, we are meticulously cleaning a wedding gown after the big day and then preserving it so it can last for generations. It’s easy for us to forget that cleaning and preserving wedding gowns isn’t exactly a typical day at work for other people and that most people don’t know what this entails, so we thought we’d let you in on what wedding gown preservation really is. Every gown that comes through our doors gets inspected thoroughly. 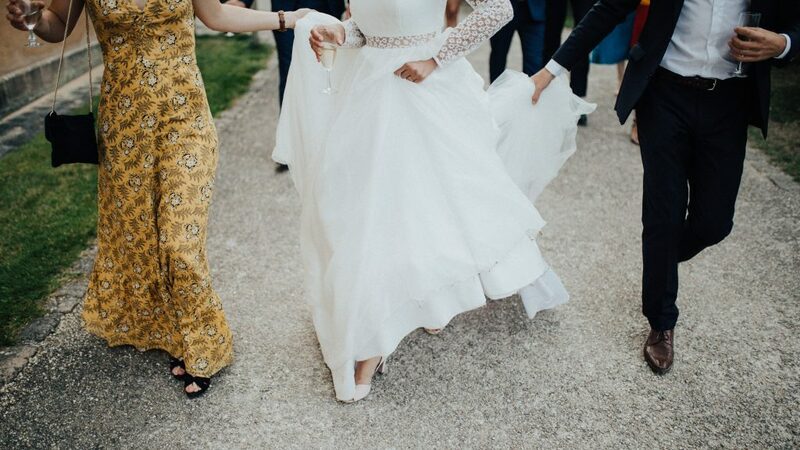 We’ll certainly ask you questions about whether there are any stains you know of or loose details, but we know that you may have forgotten the little splash that hit your dress during the champagne toast or may not even know that someone’s lipstick touched your veil during a congratulatory hug. We take extra care to find anything that might need some special attention. Not all wedding gowns need the same type of cleaning. This is the moment when you’ll be thankful you chose an expert. Different fabrics, details, and types of stains can all impact how the dress should be cleaned. Once the cleaning method has been chosen, the dress needs to be cleaned. This part shouldn’t be rushed and may involve some cleaning, inspecting, and then further cleaning. If the gown is especially delicate, your wedding gown cleaning specialist may choose a method like Solvair®, which doesn’t involve any heat. Whoever is cleaning your gown should always (and we mean always) let you come in and look at it before they pack it up. Pay close attention to the spots where there were stains and make sure that all of the buttons and sequins are secure. Wedding gowns are best preserved with acid-free paper, body forms, and boxes. These three work together to ensure that your gown keeps its form and also doesn’t discolour. Many cleaners (like us!) include special white gloves and a resealable box so that you can sneak a peek at your dress from time to time and then seal it back up for safe keeping. If you happen to be a bride handing over the most precious garment you own to someone to be cleaned and preserved, you’re probably feeling a little nervous. This is your wedding gown, after all! Make sure that whoever is cleaning your gown is an expert. One of the ways you can tell is if they are members of the Association of Wedding Gown Specialists. This ensures that you’re receiving the highest level of care, backed by guarantees. Not to toot our own horn, but at Parkers, we are wedding gown specialists and are members of the Association of Wedding Gown Specialists (we bet you saw that coming). Bring your wedding gown to us or schedule a pickup and we’d be honoured to clean and preserve your wedding dress.